Sometimes crappy things happen to good people and today quarterback Buck Pierce is experiencing that feeling after being released by the BC Lions. Last year at this time he had just been named the Lions undisputed number one quarterback heading into training camp. But after another season with injury troubles to both his shoulder and head (concussions), Pierce became a victim of the business side of football. There was no way the Lions could carry him and his $300,000 contract this season. He was due a bonus payment on March 15th. Pierce was released just a day after the Lions announced a contract extension for Casey Printers. 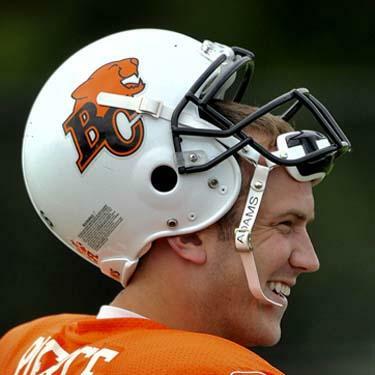 The BC Lions Football Club announced today that quarterback Buck Pierce has been released. “Buck has been a consummate professional during his time with our organization and in addition to thanking him for his efforts over the past five seasons we also wish him the very best in the future,” said Lions GM and head coach Wally Buono. Originally joining the club as a free agent in 2005, Piercewent on to start 34 of his 86 career games in the CFL, compiling a mark of 21-12-1. He leaves the Leos ranked seventh on the club’s all-time passing list with 8,734 yards and sixth all-time with 692 completions. His career passing efficiency rating of 93.6 is third-best among all Lions quarterbacks behind only Dave Dickenson and Casey Printers. In 2009, he appeared in 12 of 18 games for the club including the first seven of the season and five consecutive games from September 19th to October 18th. Buck led the club in passing yards with 2,272 and 10 TD passes including three, 300-yard passing games in 2009, giving him eight for his five-year career. Pierce is truly one of the good guys. He always had time to chat with kids or fans at practice and training camp and he made many community appearances. I had the pleasure of meeting his parents at a tailgate party one year and it was clear to see where he got his values and demeanour. As a player, Pierce was as tough as they come. Often playing hurt, Pierce gave his all to the Lions and was a valuable asset both as a starter and a backup during his time with the team. On behalf of BCLionsDen.ca and all our members, I would like to thank Buck Pierce for his contributions to the team and our community, and we wish him all the best in his future endeavours.